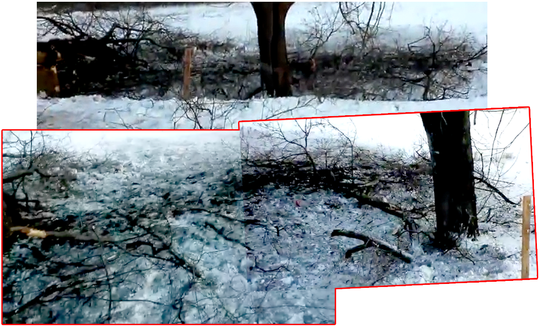 The ATO map of January 14 suddenly changes the color of the area between the H20 road and the Kalmius River north of Volnovakha from Ukraine to DPR. 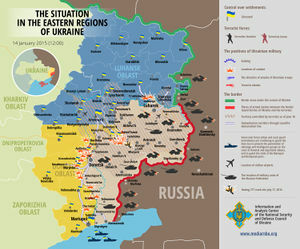 It is unknowed it this reflects a real change on the ground, or if ATO just acknowledges earlier losses. 1 Initial Controversy: Rockets or Mines? 10 Direction of artillery strike? 19 Motive to Kill These Passengers? Initial Controversy: Rockets or Mines? 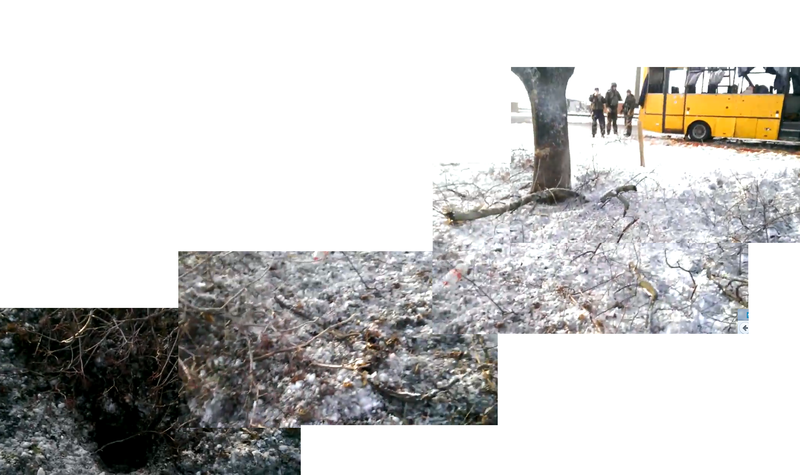 Ukraine distributes photos of a bus hit under Volnovakha, 10 people said to be killed, 13 wounded. (0:01) Snezhanna: "The blow was to the head (shows)". See, it is all bloodied (shows a hat). "There was a concrete barrier at the checkpoint. Our bus starts to turn, towards the shoulder. Not 90 degrees, but may be about 60 degrees (shows). A pop/bang/clap goes off, windows were broken, I was thrown onto people further on the seats"
Presenter: Snezhanna Karpeko was wounded on a bus at Volnovakha, she is a living witness. Andrei Spivak, acting prosecutor general, DPR. Damage on the bus was caused by anti-personnel mine. Criminal investigation was started. More survivors. Man 1, recall a queue -2 buses in front. Their bus stopped. Few minutes later, "big explosion". Bus was full, people were standing, not just sitting. Something hit him on the head, and right arm bones were broken. A young guy next to him was killed. He crawled out of a shattered window, got first help, and taken to a hospital. Man 2, recalls several buses in front, they were gradually leaving, one other bus was eventually in front and was checked. They had doors closed, as there was no command to open. He was standing next to the front door. Than there was an explosion. There were couple of familiar girls in front. He is loosing his track, starts to mumble- says "2 or 3, do not remember"--not clear what he means. Video cuts off. Bus driver interview, korrespondent.net "In front of me at the checkpoint a big bus Mariupol entered, and it was checked. The guys from the National Guard waved me to pull closed. I stopped at the back (of another bus). Opening door was not allowed: a check was on-going. And then some rustling on the left side, the hum, and an explosion". (note: this suggests that speed was subsonic). - What do you think, from which side the firing was conducted? - They were shooting along the bus direction. 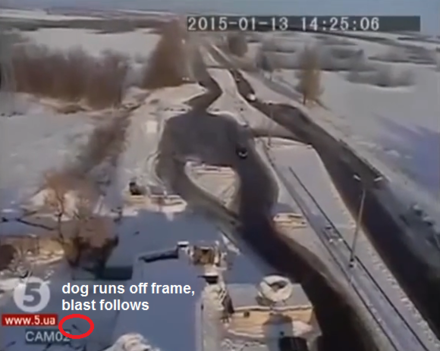 I went in the direction of Donetsk, shooting came from the left side of Volnovakha. This is our "northern region" as it is called. Not from Dokuchaevsk. - What (weapon), in your opinion, the shots were fired from? 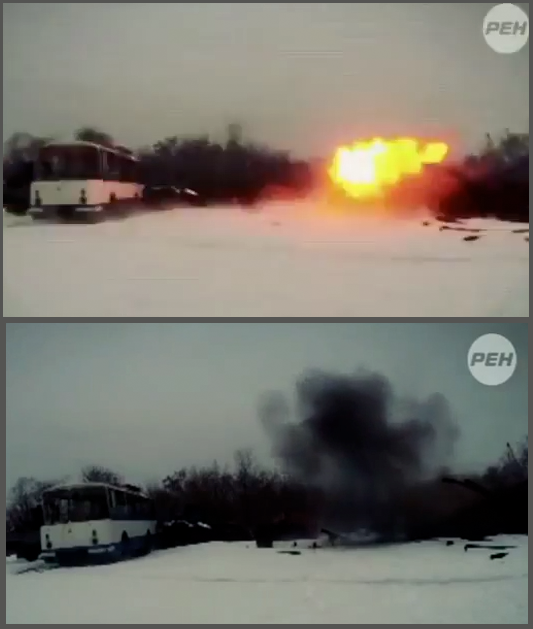 In the Russian version they have: 'Olga has no doubts that the passengers died because of a Grad shell. "I live in ATO area and know how it (text before imply it =Grad) sounds." "When shells were flying it was well audible"
Another issue with this new report is their presentation of Velry, no last name given. He says he was driving his own car, speaks in detail, and makes it sound like he was uninjured. 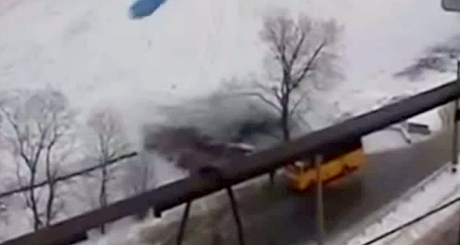 But they show a picture of "64-year-old Valery Zubko," injured bus passenger. I don't suppose he's misrepresented himself, and this is just a mix-up on the paper's part (there are a few of these). Longer version. The guy calls somebody "Artem" and tell about explosion(s) at the checkpoint; also stops at a next checkpoint, asks what happens and asks to call to check what happened. More observations on video. Some noise starts 1:12, two seconds prior to explosion; got noisy microphone, vibration/wind, or something incoming (unclear). Somebody seen running into the woods and explosion follows immediately. 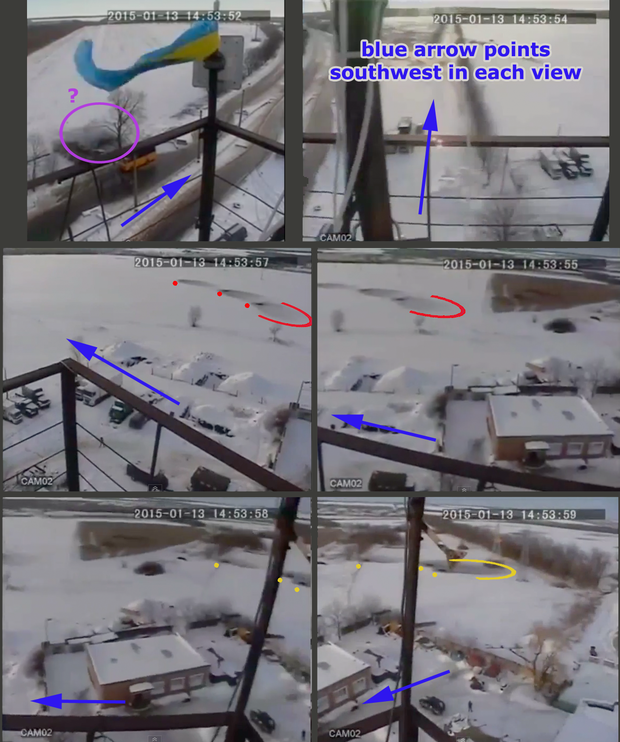 In total, camera/car stay pointed Northward for about 10 seconds; apart from that 2 second noise (real or microphone-caused), and a single explosion, there is nothing else seen/heard exploding. 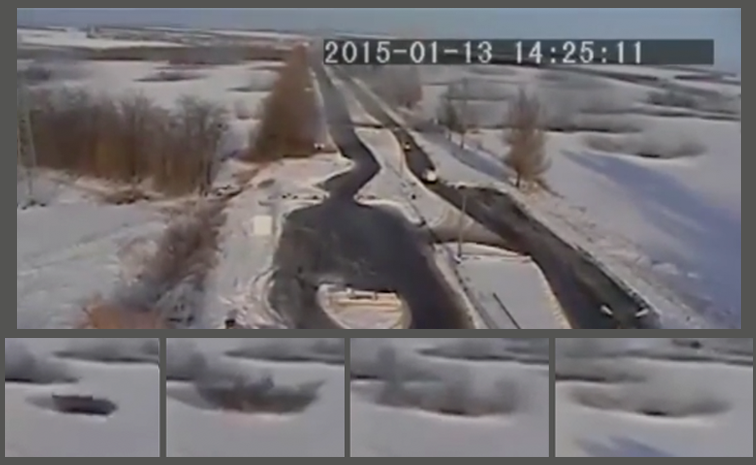 While Poroshenko video explosions continue for 20 seconds, with cloud from behind seen towards the end. 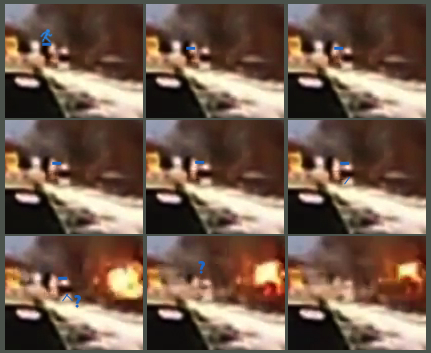 So what we see does not look consistent with multi-explosions on the other video. Video correlation, plus the move towards woods, supports that possibility, as well as yet another grad impact. Point being, the videos and audio (boosted, filtered, slow-and-low like the video) seem to line up. I took one more careful review, and here's my take, and attempt to show it with a 9-frame analysis of this scene. The blue bar shows the person in about that position, floating above their head as they run. Note: here it seems the person runs behind the snowman, but in full motion he/she seems to be passing in front, and just blends into the the black there, except their lower half, and then disappears upon the explosion before there's a clearer frame. From around 11:29 and 12:12 - I can't see what characters those are below what looks like stop, I guess. If it says mines, etc., I'd like to see how. Nice stencils and spray paint, prominent placement, partly above the moderate snow-line ... should have been an ominous thing to stare at for the folks on the bus, if it was there at the time. Oh and another one at 0:32, again left side further north, just left of the time stamp at top. Again it's just behind the trees - a flash, and gray smoke cloud rises. Also, a smoke cloud of that type is drifting on-frame what may be fouth such blast to the left/behind, but we can't see that flash or where it was. 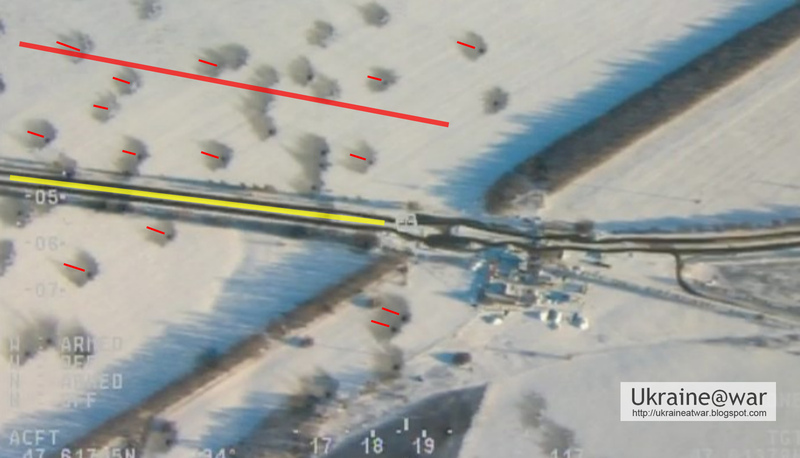 The next day after the hit, the Russian-sponsored "Novorossiya" media (the name of the movement advocating a fictitious pro-Russian realm to be made up of parts of Ukraine, Moldova and Belarus) began pointing out the mine warning signs along the side of the road, visible in the first Ukrainian military's video. These were unmistakeable, as even without a close-up, their shape, colour and placement indicated they were likely such signs. 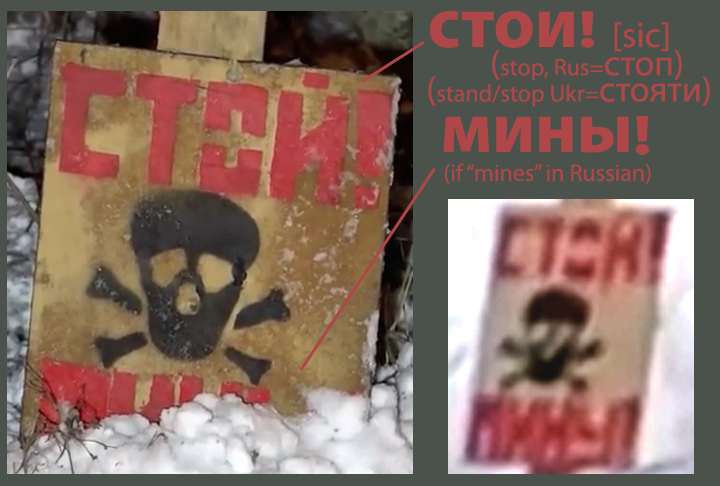 These signs were recognizable to locals as mine signs -- they are all over the place in the Donbass now. Ukrainian military officers at the checkpoint told Human Rights Watch that there were no landmines near the checkpoint except signal mines (trip flare) and that the signs were there to prevent people from running into the field. Donestk, Jan. 16: investigated "the following day"
Donetsk, Jan. 22: "Human Rights Watch arrived to investigate the incident on January 24"
Besides ceasing the production and development of anti-personnel mines, a party to the treaty must destroy its stockpile of anti-personnel mines within four years, although it may retain a small number for training purposes (mine-clearance, detection, etc.). Within ten years after ratifying the treaty, the country should have cleared all of its mined areas. This is a difficult task for many countries, but at the annual meetings (see below) they may request an extension and assistance. ICBL June 2014: International Committee to Ban Landmines (ICBL)announces US finally intends to sign on. Russia still hasn't shown any sign. "Along with Ukraine and Belarus, Greece has been in non-compliance of the treaty for some years for failing to meet its stockpile destruction deadline." ICBL July 2014: notes with worry reports that separatists had banned mines, seized in Slavyansk, under gov. control now, safe. "Last month, Ukraine accused Russian forces of laying both antipersonnel and antivehicle mines in Ukraine and stated that the government of Ukraine has not used landmines in the conflict. The ICBL strongly urges all parties to the conflict to ensure no antipersonnel mines are used by any actor and to destroy any antipersonnel mines they have seized or otherwise acquired." reliefweb, up to October 2014: "There was no confirmed use of landmines by a member of the Mine Ban Treaty in the reporting period, from September 2013 to October 2014. There has only been one confirmed instance of a violation of the ban on use by a State Party, by Yemen in 2011. 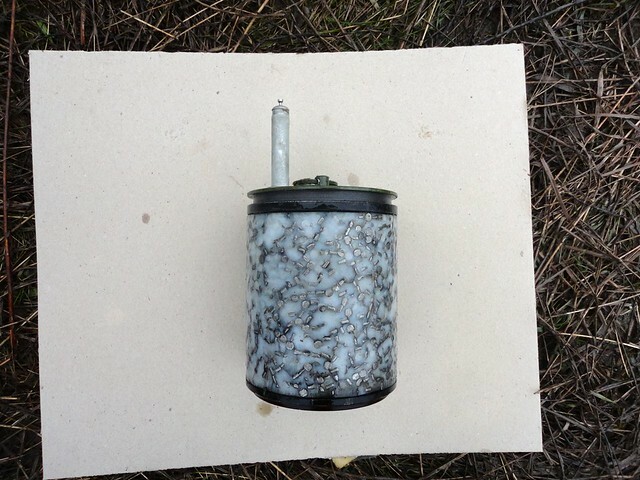 Stocks of antipersonnel mines are present in the ongoing conflict in Ukraine between government forces and Russian-backed separatists, although it is not yet possible to determine whether antipersonnel mines have been used. 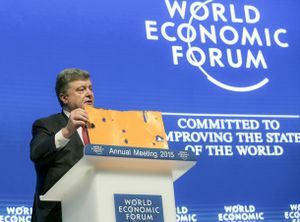 Ukraine is a State Party to the treaty." AP via Fox News, June 24, 2014 Kiev's mission in Geneva accuses Russia, ominously a non-signatory, of laying mines in Crimea and elsewhere in Ukraine's southeast, killing Ukrainian soldiers, and of stealing some 600 Ukie mines they were allowed to keep "for training." "In the mine report, Ukraine's Geneva-based mission said soldiers have been unable to defend themselves with mines from daily attacks conducted from Russian territory because Ukraine is bound by restrictions in the anti-mine treaty." OZM 72: Not a weapons expert, I'll start by taking Resup's lead and looked into specifically the OZM 72 'frog' mine. Compare: the type of impact seen where it seems rockets landed: dirt cloud, no fireball or even flash visible (except in a few cases, a flash), no smoke cloud rising, dust settles in an oval drawn out by the breeze. The other type seen, by the bus and at two spots at least up the road on the left side. 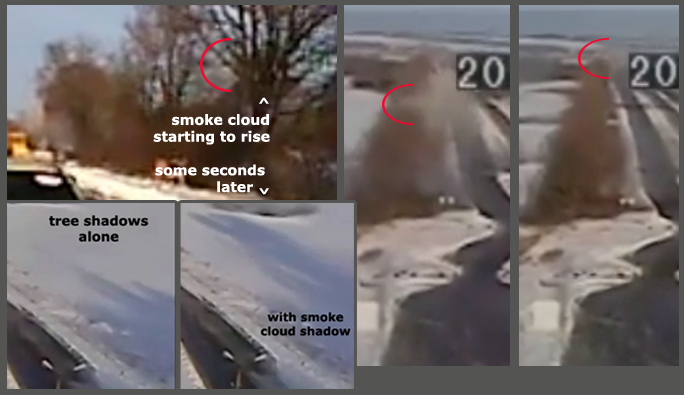 Signs: a clean flash and fireball a bit above ground level, always just behind or the treeline, or its center, with violent ejection of material sideways, no dirt cloud (and no signs of real disturbance in the dirt, nor an oval of settled dirt), followed by fast-rising black or gray (?) smoke cloud. The different colors of smoke make me wonder if there aren't three types of blast, with these two being very similar but not quite the same. However, if this is cylindrical "jumping frog" mine, it will depend on tilt after it jumped. 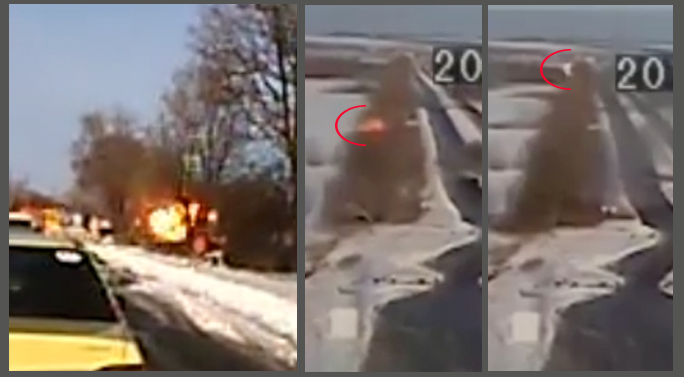 Tilting cylinder away from the road will send blast going upward in the bus direction; while soot/debris on the ground will extend more along the road than across (as we see indeed). Slight axes tilt parallel to the road may result in large imprint towards South. 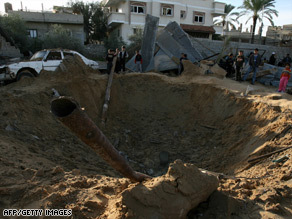 Of course if it was mine, it was just sitting there in the ground and did not arrive by rocket from NNE. 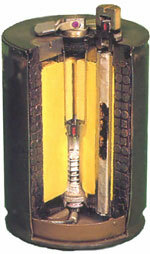 The Soviet Union also based the design of its OZM series of landmines on the German S-mine. The Soviet mines tended to be far simpler internally; instead of being filled with ball bearings or scrap metal, the OZM-4 mine was given a solid cast-iron body that would fragment on its own. 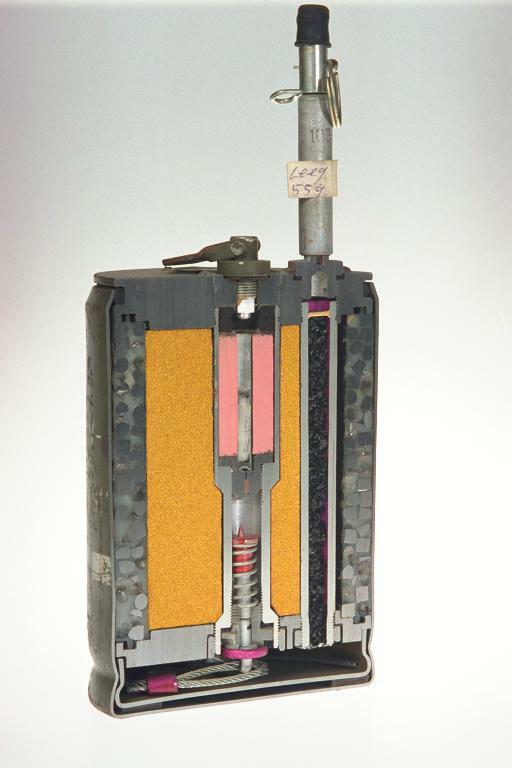 Later, the OZM-72 bounding mine was filled with steel rods, returning to the original concept of the S-mine. Both of these mines are still being produced by Russia. Sergei Cherenko, the bus driver, was interviewed by pro-Kiev Korrespondent.net. 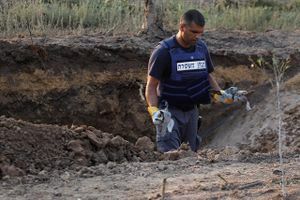 He said there was Grad fire with multiple impacts, but not by the bus; “if Grad would hit nearby, I would have never talked to you.” He thinks the blast was from a mine; “Just at the checkpoint there are still mines. And one mine, a fragmentation one, went off.”  He has an opinion on rocket fire direction – “from the left side of Volnovakha. ... Not from Dokuchaevsk.” (that is, from government-held territory to the west). The physical impacts say northeast, as far as I can see, and his impression loses the dispute. 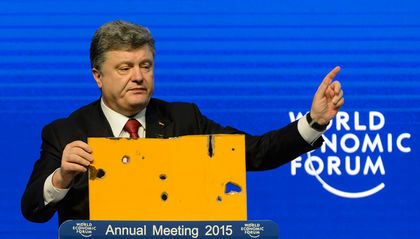 Likely it was the westerly wind, and maybe an anti-Kiev bias, fooling him. He may be right about the mine anyway, and so far is a widely-cited support for it, but as a person talking, he cannot be the best evidence. Maybe the scare tactic signs just influenced his thinking, right? Russia has not formally offered a scenario, but state-controlled media has clearly come out against the Ukrainian narrative, evidenced by their interview of a fake victim on Vesti on January 14 that supported the mine theory. The link is not to what the "fake victim" said, but conveniently right to [http://uatoday.tv/politics/russian-tv-accused-of-faking-bus-attack-survivor-interview-403256.html his reasons (via pro-Kiev UAToday) to call her fake. On the day after the tragedy, Russian state TV channel ‘Rossiya 1' broadcast an interview with an alleged survivor of the bus attack who claims that the deadly blast was local in nature and not part of a rocket barrage. Ukrainian media outlets have raised a number of concerns about the credibility of the ‘Rossiya 1' report, pointing out that the interviewee, who is named as Snezhana Karpeka, does not feature on any of the lists of dead and wounded which have been made available to the public by the Ukrainian authorities. ..the interview takes place just one day after the attack in what appears to be the interviewee's home, despite the fact that none of the wounded had at that point been discharged from the hospital. Security camera footage which has emerged since the incident appears to confirm that it was a Grad rocket attack. Throughout the Ukrainian conflict, the Russian media has been repeatedly accused of faking news coverage as part of a systematic disinformation campaign. Jumping mines: first jump at a height 0.8-1.4 m, than explode. May be activated by trip wire, electronic fuzes (sensor may extend 13 m ) , or command initiation. I think we may be mixing up two things: Sergey Nikolaevich is saying that the "dispersion ellipses there are perpendicular to the roadway". I understand this to mean is that the pattern formed by the 60 or so hits forms an elliptical pattern. THis is because artillery is more acurate in direction than in distance. From the major axis of the ellipse it is possible to deduce the direction to the origin -- almost. Problem is that both directions are equally likely. The ellipse is not exactly perpendicular, but crosses the NE-SW road in a n 45 degree angle, meaning the strikes came from the west or from the east. Likely he means individual hits, putting together 50 hits is cumbersome and not very meaningful. Not sure which hits; maybe latest hits which could be found nearby, possibly not the bus itself. Starting very non-technical, I would like to get a feel for the size of the two clear above-surface fireball explosions here. These are the one by the bus, and the nearer of the two seen on the left side of the road above, and some readings on Grad impact fireballs vs. landmine-scale ones. The charge of the State Department against the DPR was published the day before the Volnovakha - Hunter New, 14.01.2015.
page 2, translated to Russianby Cyber Berkut google translation Information campaign on charges of power block so-called "Donetsk People's Republic" (DNR) and "People's Republic of Luhansk" (LC) in the deaths of civilians. The bus shelling incident in Volnovakha could have been organized by the Security Service of Ukraine, hackers from CyberBerkut group claim, publishing compromised SBU documents on the official website of the network. In a ‘confidential’ letter from January 13, SBU first deputy head Basil Gritsak instructed Gennady Kuznetsov, head of the center “A” of SBU Anti-Terrorist Center, to carry out a provocative campaign, aimed at laying the blame for civilian deaths on independence supporters in Donetsk and Lugansk People's Republic. Gritsak ordered “to plan and submit proposals for provocative actions, which would help to charge DNR and LNR militias with civilian deaths”. CyberBerkut also published a cryptogram, where employees of the SBU Office in Donetsk reported they had implemented “propaganda campaign to make the required informational impact on Ukraine's population”. The cryptogram was sent from SBU Office in Donetsk region to Kiev and Kramatorsk. The network also released a list of media publications, accusing independence supporters of shelling the bus. "Rockets". They do not give any details how that determination was made, or what "rockets". Russia’s envoy to the Organization for Security and Cooperation in Europe (OSCE) has confirmed a conclusion by the European body that a recent attack in Ukraine’s Volnovakha was not carried out by pro-Russia forces. 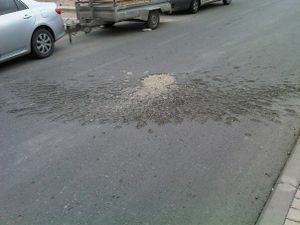 “The [OSCE] monitors examined the craters on the site of the attack. 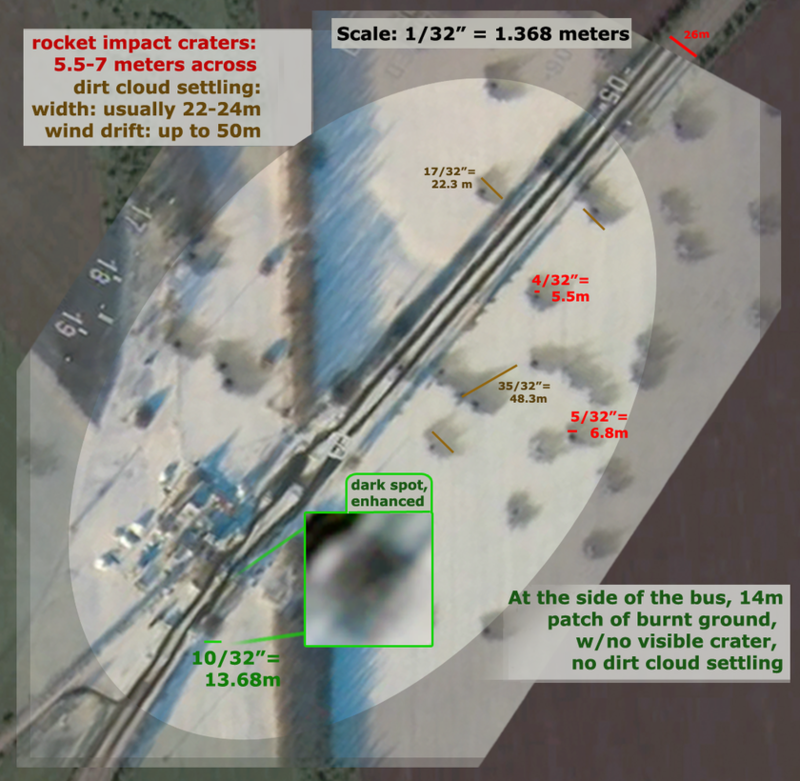 The conclusions are that the fire did come from a Grad [multiple rocket launcher] system but not from an eastern direction as the Ukrainian military has claimed but from a northern direction,” Rossiya 24 quoted Andrei Kelin as saying on Sunday. So I tweeted the image w OSCE snippet. I don't think we're wrong on this. 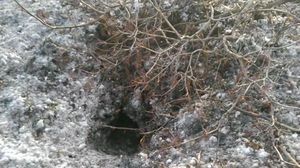 "OSCE "The SMM (inspected) five craters ... caused by rockets fired from NNE." Why not these 6?" 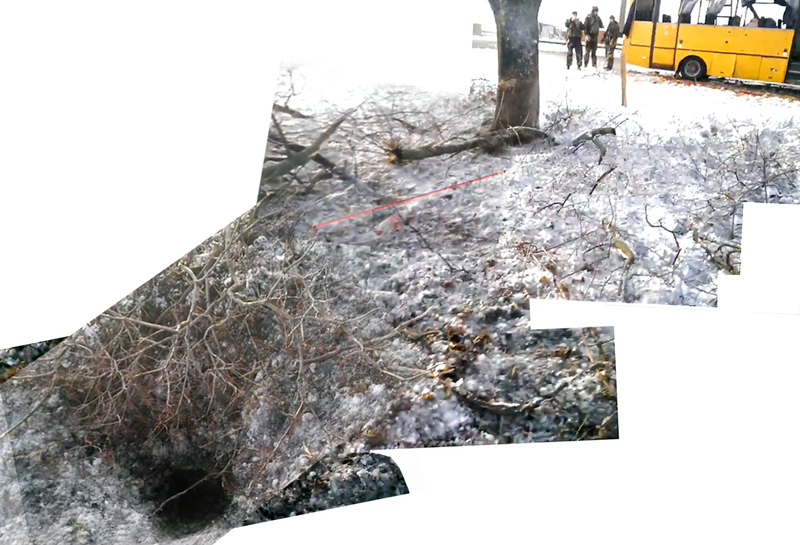 Looking to be more direct, noticed a tweet of their next step, Jan. 15 statement: "The Unmanned Aerial Vehicle (UAV)conducted a flight over the Ukrainian checkpoint in Volnovakha and gathered imagery and video data of shell impact craters at the incident site where the passenger bus was hit on 13 January." At the tweet summarizing this, responses before me were pro-Kiev neo-Nazis raging that OSCE is Putin's tool. My later reply probably isn't a direct clue onto why, but I like how it works in context. "@OSCE Excellent. 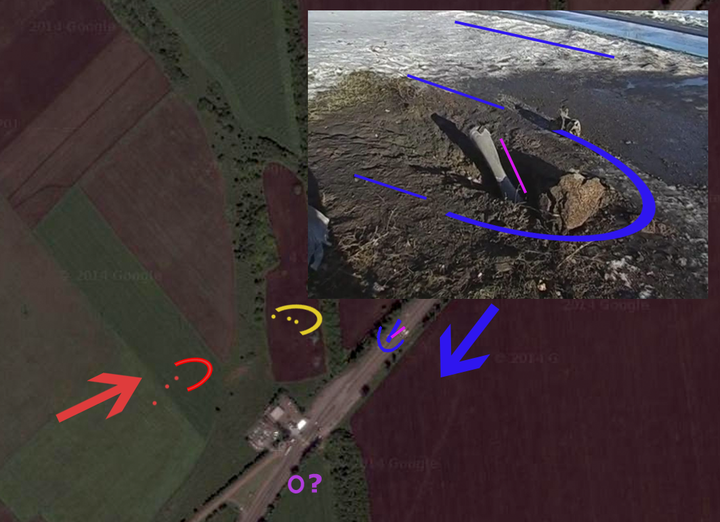 You'll see the ones originating from SW, Bandera turf where the Nazis hate OSCE - wonder why" + link. OSCE looked at 5 (possibly direction-wise) but examined in detail 2. Likely the 2 is bus itself, and what we see on the road. Nobody saw Grad at the bus location on the day (even if there is Grad storage there now) . While at the road, takes no effort to fake. Throw a blast there with anything to dig up a hole; through engine part in the hole. One hour job, not costly. --Resup (talk) 16:40, 19 January 2015 (UTC) "The SMM conducted a comprehensive inspection, focusing on five craters caused by explosions that had occurred during the incident. 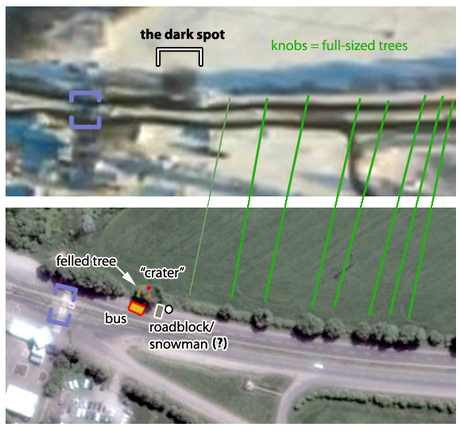 The investigation included comprehensive crater analysis of two specific blast craters, including the crater located 10 metres from the side of the passenger bus. In the SMM’s assessment all craters examined were caused by rockets fired from a north-north-eastern direction"
Motive to Kill These Passengers? I'm in the process of drafting a report on this, but wanted to pause and consider a few things here. I've just added an analysis of the possible mine-triggering sequence that paints a troubling picture. If it's a mine, of course it was set just 10 meters from the road. Some say a directional weapon best pointed away from the road, it was pointed at the bus. And it was triggered by a tripewire almost on the road. WTF? Who sets that up? I wonder, am I just wrong? I wasn't thinking this was set up as a murder device, as a "massacre" like people say. Just overboard and criminal negligence with an unlucky trigger. But, hey... maybe. They were all or mainly from the DPR, choosing to live there, just then returning. This, to some among the occupiers, makes them traitors. They only had to leave to get their pension money, etc. since Kiev stopped disbursements in rebel territory. Sources say the pensioners went to Mariupol for this. They died on the way back, not the way out; clarifies intent to stay in DPR and not defect at this chance, and means some would have cash one them. One wonders where that wound up? 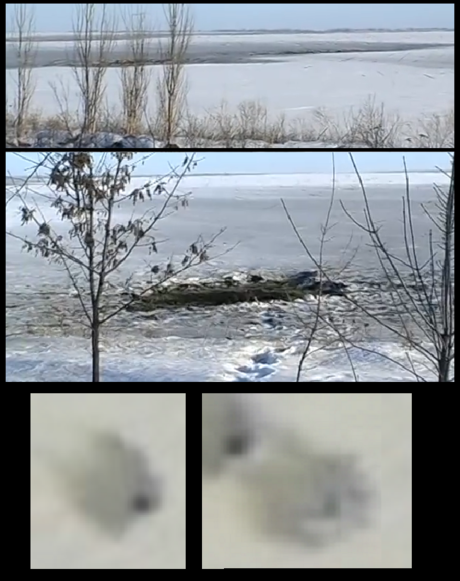 What kind of mindfuck to those who live in the DPR could this be? "You have to come out to get paid, but you might not make it back alive. We can blow you up with landmines and take your money, and blame your own "terrorist" army for the "deliberate massacre" and get more weapons sent to us!" Implications are complex: no way is this a coincidental separatist rocket barrage: it would be the spark, but not meant to kill directly, just scare someone to trip the murder mine. But why? What if that didn't happen? (remote command nackup - or that was used and the 'mine stepper' is coincidental, or there was no tripwire) Rockets just too inaccurate? Just part of the mindfuck mentioned in the above point? 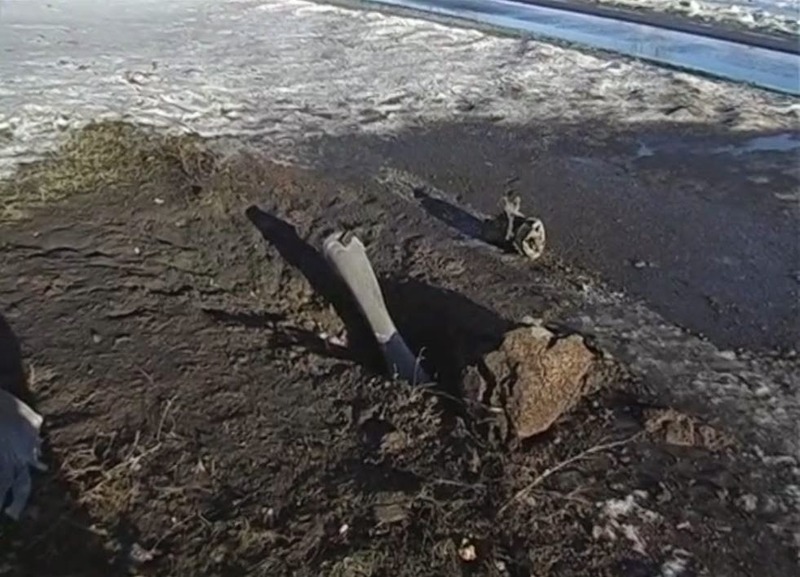 impact hole in dirt instead of crater is seen in Mariupol attacks, not uncommon at sidewalk's edge, on harder-packed ground, in cases. All city dirt though, may have stuff under. The soil here is softer, but maybe there was a tree root or even it was triggered by a strong branch on the sideways tree, and somehow the rocket (tail?) still makes a tunnel like that. For a hole, it needs to embed very shallowly so that explosion is above ground. Or just slightly below in hardly packed stuff so most of it ends up going up, not sideways; then it would be like smaller crater. But we see here quite deep still very neat hole, a Grad would damage this round shaft considerably. Shaft looks made by digging, to place mine/IED, with almost no explosive damage. But it would be curious to collect impact images still, as a side project. 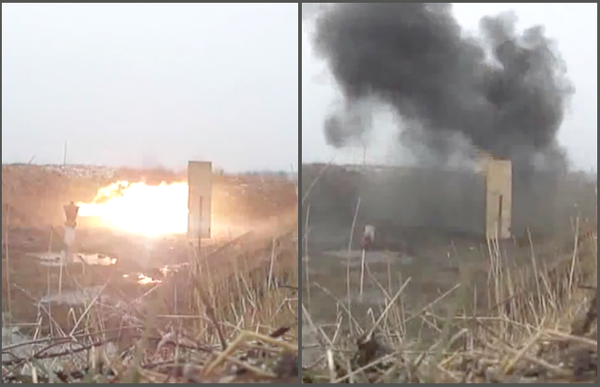 BTW in Mariupol I seen talk that not all shelling was Grad, there was, or could be, something else. It was some vague talk, don't think anybody figured that out. - fireball size analysis: I don't have a very wide of reliable base to say Grad fireballs are 14m - nor that mines' are 6-7m - and even the V blast - well-measured - might have been wider before, in a missing video frame - but I stand by it being around that size, and if that can be clearly shown too big/too small for either, whatever, great. But I can't do that very well yet. This page was last edited on 23 February 2015, at 00:52.